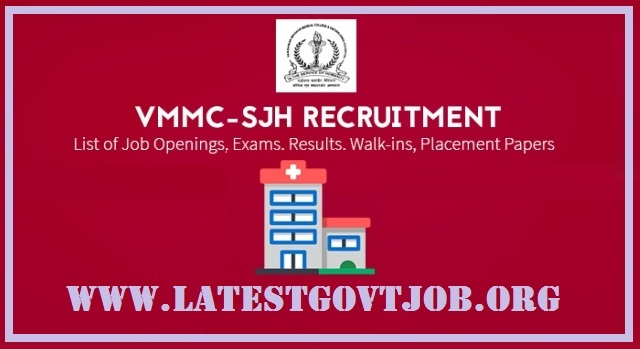 VMMC & SJH Recruitment 2018 for Junior Resident 234 Vacancies @www.vmmc-sjh.nic.in : The Medical Superintendent of Vardhman Mahavir Medical College (VMMC) and Safdarjung Hospital (SJH) has released a notification for the recruitment of 234 Junior Residents MBBS and BDS & Maxillofacial Surgery in various departments. Interested candidates may check the vacancy details and apply online from 26-05-2017 to 09-06-2018. General/UR candidates have to pay Rs. 500 and OBC candidates have to pay Rs. 250 through NEFT & RTGS OR online transfer to the Account "SJH AND VMMC EXAM FEE AC"
SC/ST/PWD candidates don't have to pay any fee. Interested and eligible candidates may apply online through VMMC & SJH website - http://www.vmmc-sjh.nic.in/ - from 26-05-2017 to 09-06-2018.